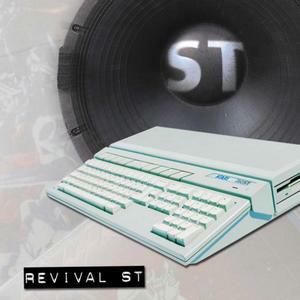 Soon, to the thronged masses of the ST retro scene, comes Revival ST : the first ever true Atari ST remix tribute album. For former owners of the Atari ST home computer, this CD has been a long time coming. For those who have either never owned or heard the ST in action, this CD will be your chance to hear some of the very best themes made on the Atari ST -- remade using modern technology and in a studio environment. The Atari ST was often considered to be weak in the sound department with its use of the backward YM chip. But the great thing about this poor little chip is that many musicians (such as those featured on this CD) managed to make the YM experience just so much more than what it should have been at the drawing board. Many ST classics can be likened to the Commodore 64's in style and sound, despite the YM's inferior ability. And so, the CD should appeal not just to former owners of the Atari ST but also to owners of the Commodore 64 and Amiga, if they dare to try! Taking advantage on knowledge gained from the production of previous titles, the series of remix CDs takes another leap forward and promises to be something rather special. Revival ST has taken over 2 years to create. Gianlucca Verrengia wrote the music for several top video games, one of which is Hooligans . Rafael Dyll has been a keyboarder in the cult synth-pop band Invisible Limits and has also worked on the book Game.Machines . Fabian Del priore is the LEAD composer on the CD's Merregnon 1 and 2 and is also an arranger for the Games Convention concerts in Germany. Exolon features no less than 6 REAL instruments and FOUR vocalists. Chris Huelsbeck himself gave vital input on Quick & Silva. The original composition was Chris's work. The morse code on Dragon Flight 1 by Sonic Wanderer spells ATARI . DBA6 was completely created using only soft-synths, helping to maintain the feel of the ST perfectly. Period in 3D lasts for a staggering 10 mins. Markus Holler's music for the videogame S.T.A.L.K.E.R was featured LIVE at the Game Convention Symphonic Concert in Leipzig in 2004. Rob Hubbard's Jupiter Probe was his ONLY unique music on the Atari ST, other work on the ST were covers of Commdore 64 tunes.